Resistance testers are available for insulation- and ground-resistance testing. Insulation resistance testing ensures transmission and distribution equipment continue to operate, eliminating outages or downtime. Test insulation on power MV and HV transformers, current transformers, cables, motors, generators, and circuit breakers. 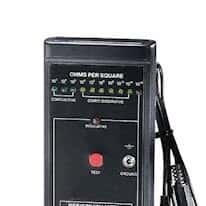 A ground-resistance tester is typically used to measure power and cell tower grounding, monitor sub-stations, perform plant maintenance, assess insulation resistance, and deliver results for similar industrial electrical applications. Some automated testers conduct the test and do the calculations for you. We have a wide variety of basic and advanced testers.